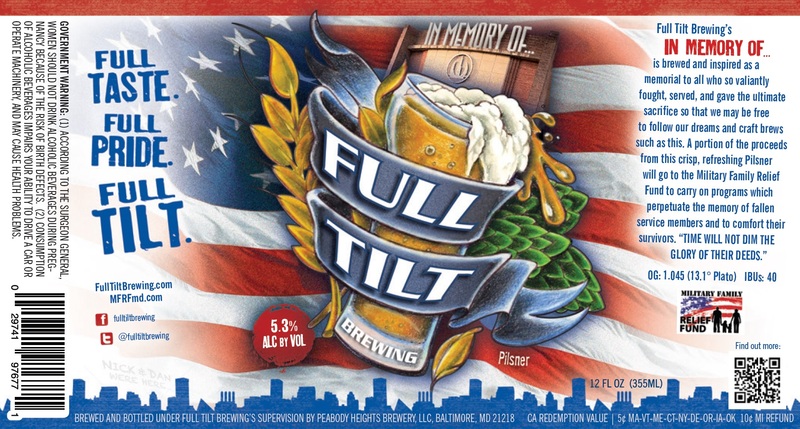 Baltimore, Maryland – FULL TILT BREWING is set to release their newest offering, “IN MEMORY OF…”; a 5.3% Pilsner benefiting the local non-profit, The Military Relief Fund of Maryland. This beer launch is open to the public. FULL TILT BREWING (FTB) is excited to announce their latest release, “IN MEMORY OF…”. The launch of their newest addition to the ever growing craft beer market will take place on Friday, May 15th at Parker’s located at 11131 Pulaski Highway, White Marsh, MD 21162. The event and pouring of the first pint of “IN MEMORY OF…” will take place at 6:00PM. In addition to “IN MEMORY OF…” on draft at the inside bar, Parker’s will also have several other FTB beers available in bottles at the outside bar. Full Tilt beers will be on special all night at $3 per draft and $3.50 per bottle. For added entertainment local rockers, The Charles Parker Band, will take the stage from 7:00PM to 11:00PM. The Charles Parker Band is a cover band playing songs by artists from Steve Miller to Foo Fighters to Aerosmith. There is no cover charge for entry. This Pilsner was inspired initially by FTB owner, Nick’s, prior service in the US Navy and both Nick and Dan’s desire to help the families of those who served and gave so much more… their life. We, at Full Tilt Brewing, feel blessed to be here today; free to brew for all of our fellow men and women of this great country. As a veteran-owned company, we know that freedom does not come without great sacrifice. We all, as free citizens of this great country, are here today because of those who have given their lives to preserve our freedom and way of life. To those brave souls who gave the ultimate sacrifice so that we may continue to live a full and happy life, we salute and cheers “IN MEMORY OF…: you. “IN MEMORY OF…” marks FTB’s third local collaborative effort. Prior to this brew, FTB has partnered with local legendary dessert, the Berger Cookie in crafting their highly sought after milk stout and most recently with the Chesapeake Bay Trust with The Bay IPA which raises funds to support CBT’s Bay restoration efforts. FULL TILT BREWING comes from the background of not-cutting corners as its owners are passionate about every aspect of what they do. As it states on the opening page of their website, “Why do something half assed when you can do it full tilt?” and “Never slow down, never settle for less, and never be content with anything other than the best.” This newest addition to the FTB line of brews continues that mantra. FTB will debut their newest offering at a keg tapping ceremony at Parker’s located at 11131 Pulaski Highway, White Marsh, MD 21162. For more information about FTB, visit www.fulltiltbrewing.com or call (603) 828-1478 or email info@fulltiltbrewing.com. FTB is also on Facebook (www.facebook.com/fulltiltbrewing) and Twitter (@fulltiltbrewing).